Peter Ualrig Kennedy appreciates the warmth and variety in Rose Cook’s recent collection. pitched down to stone steps, unnoticed. a year on from your fall? This is what lucky looks like. grateful. It shines in their eyes. How brightened are those, who almost died. I suspect that many of us can relate to that. And I like the way she writes – directly and with a straightforward emotion. In subsequent poems death and grief have their sway. We are being conducted through a labyrinth of beginnings and endings – we may take our cue from the cover image, a photograph credited to the author, showing a tondo labyrinth carved on a tombstone, an image of life’s complex journey. the promise of fresh sillion in the fields. close to the fire with a smile. his entire life in solitude. But believe me, this lovely collection of Rose Cook’s poetry is a far cry from being a chthonic mayday. The poems are full of sensitivity and emotion, not to forget several outbursts of sheer humour and gaiety, as in the delightfully titled “A Situation Arising from a Complete Inability to Master Any Language but her Own”. And I am not going to give the game away on that one; you’ll have to read it for your-self. 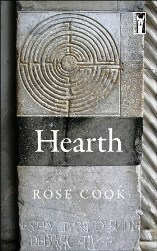 ‘Hearth’ has been portrayed by Rebecca Gethin as a “treasure trove of poems” and it would be hard to improve on that description. Recommended. London Grip Poetry Review – Laskey	‘Körper’, Sasha Waltz and Guests, Sadlers Wells. Review by Julia Pascal.